Medical Ministry International is partnering with Global Eye Mission to support their program at the Bethesda Mission Hospital. Dr. Steve Anderson, serving with Global Eye Mission, is working with Bethesda Hospital to help develop a new long-term clinical and surgical eye unit to serve the people of this region. Medical Ministry International’s support is helping to fund the educational and training costs of Dr. Vika, an Indonesian ophthalmologist. Dr. Vika is in her second year of ophthalmology residency training and plans to take over the long-term leadership of the eye unit at Bethesda Mission Hospital. Bethesda Mission Hospital, located on the island of Borneo, has served the people of rural West Kalimantan, Indonesia for over 40 years. The hospital has grown over the years to become a resource for the region serving the economically poor and is sought out for its reputation of quality care and compassion. Many people in Borneo suffer from various vision impairments that can be addressed with glasses, medical treatment, or surgery. There is a great need for eye care in this underserved region with a ratio of ophthalmologists to population of about 1:1,000,000. Indonesia, a nation between the Indian and Pacific oceans, is made up of thousands of volcanic islands and is home to hundreds of ethnic groups speaking over 700 different languages. It is the world's largest island country, with more than 17,000 islands. It’s known for beaches, volcanoes, Komodo dragons and jungles sheltering elephants, orangutans and tigers. With over 261 million people, it is the world's 4th most populous country. In recent decades, health indicators have significantly improved such as rising life expectancy (from 63 in 1990 to 71 in 2012) and declining child mortality (from 84 deaths per 1,000 births in 1990 to 27 deaths in 2015). Nevertheless, Indonesia continues to face health challenges that include maternal and child health, low air quality, malnutrition, high rate of smoking, and communicable diseases. 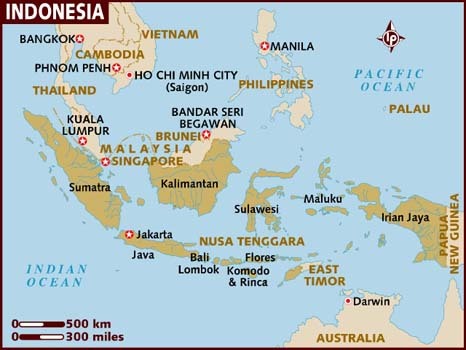 Indonesia is a country in Southest Asia located near Malaysia and Papua New Guinea. Split by the equator, Indonesia has an almost entirely tropical climate, with the coastal plains averaging 28°C, the inland and mountain areas averaging 26°C, and the higher mountain regions, 23°C. The area's relative humidity is quite high, and ranges between 70 and 90 percent. Indonesia shares land borders with Malaysia on Borneo, Papua New Guinea on the island of New Guinea, and East Timor on the island of Timor. Indonesia shares maritime borders across narrow straits with Singapore, Malaysia, Vietnam, the Philippines, and Palau to the north, and Australia to the south. Mostly coastal lowlands; larger islands have interior mountains.